This artist's impression shows the selected design for the James Webb Space Telescope. Northrop Grumman and Ball Aerospace are the prime contractors for JWST. One of NASA's most ambitious projects, the James Webb Space Telescope, is embroiled in controversy over its budget-busting costs and repeated delays. Proponents of the JWST mission tout it as the successor to the hugely popular Hubble Space Telescope and say it offers the chance to revolutionize our understanding of the universe. But many scientists worry that the observatory's expanding price tag, currently $8.7 billion, will swallow up funding for other NASA research, such as planetary science or solar physics missions. The Solar Physics Division of the American Astronomical Society weighed in with similar thoughts. 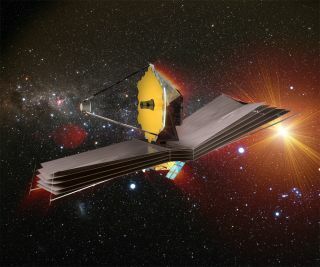 "The SPD fully supports the science goals of the JWST and the priorities of our colleagues in astronomy and astrophysics; however, it is extremely worrisome that the proposed solution to the problem will further reduce the ability of the other divisions within the NASA Science Mission Directorate to accomplish their own nationally sanctioned scientific programs," Solar Physics Division chairman David Alexander wrote in an open letter to Roy Torbert, chairman of the American Geophysics Union's Heliophysics Section. James Webb is an infrared telescope targeted for launch in 2018. It is a NASA flagship mission rated as a top priority for U.S. astrophysics in recent National Research Council decadal surveys. The mission, a joint venture of NASA, the European Space Agency and the Canadian Space Agency, is named after the former NASA administrator who ushered the agency through most of the Apollo era. In 2001, the telescope was estimated to cost $1 billion and launch in 2011. A series of engineering challenges in building the observatory pushed back the launch date and upped the price. Citing these problems, the U.S. House Appropriations Committee recently proposed canceling the project altogether, by cutting out any funds for JWST in its fiscal 2012 appropriations bill. The Senate Appropriations Committee, however, not only restored what NASA had requested for the telescope but boosted its funding. The two measures ultimately will have to be reconciled in a compromise. Meanwhile, work on the Webb observatory is progressing. Engineers recently completed the job of fully coating the telescope's 21 mirror segments with a thin layer of reflector gold. Mather is one of a panel of James Webb supporters who will advocate their project during a Wednesday (Sept. 21) web conference. Yet scientists acknowledge that JWST's budget problems are coming at a bad time, with the government looking to trim as much nonessential spending as possible. "We just really don’t know exactly what's going to happen," said planetary scientist Melissa McGrath, chairwoman of the American Astronomical Society's Division for Planetary Sciences. "I think people are really fearful right now because of the bigger context in which this is happening. There's a very budget-conscious feeling right now. There's a lot of pressure on the budget external to NASA and JWST, and that just exacerbates the problem. It's just sort of a worst-case scenario." McGrath said her division has been feeling pressure to weigh in on the debate but has resisted taking sides because there are pro- and anti-JWST scientists among its ranks. Furthermore, many researchers are privately frustrated by the James Webb budget increases; they resist openly attacking the project out of a belief that public scientific quarrels serve only to undermine funding and support for science in general. "We felt very strongly we did not want to come out criticizing another science project," McGrath told SPACE.com. "We did not want to contribute to the house divided. It just is not helpful to have these public squabbles, I don't think. A lot of the public I don't think distinguish among these various disciplines as finely as we do." Ultimately, time will tell whether a single mission as important and expensive as James Webb can make it in the current fiscal situation. "There might be across-the-board cuts to a lot of things in this world," Mather said. "We just do the best that we can here and try to make the technical plan that matches the world that we live in."